Ethan ( 12 mo child) "training" Maizie ! Mini Pigs like most other pets need training, exercise and entertainment to keep both you and your pig healthy and happy. They are highly intelligent creatures and can get bored easily if not given sufficient attention and space. Pigs are VERY smart. You can teach a pig almost anything you want, especially if you have edible rewards. 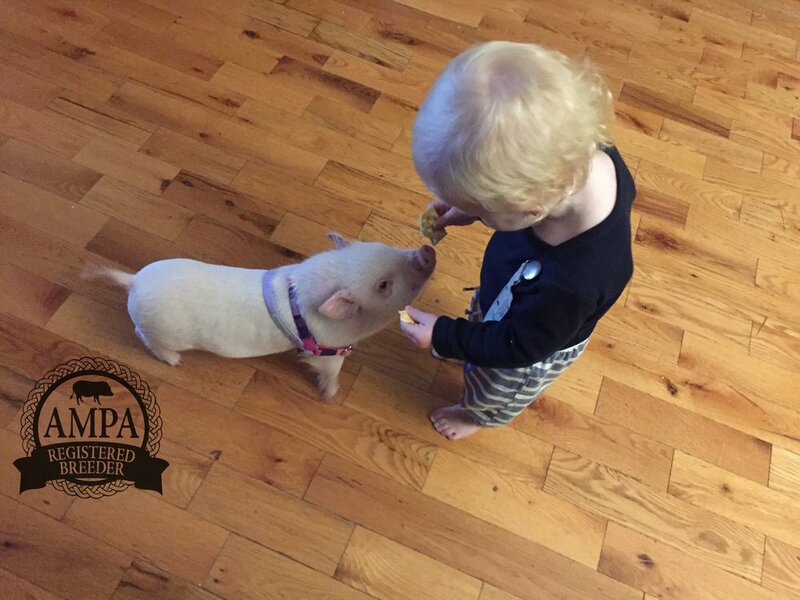 You can teach your pig to potty train, sit, roll over, give you high fives, play soccer, retrieve stuff for you, but the possibilities really are endless! Pigs enjoy going for walks as well. A lot of pigs may put up a stink at first with regards to putting their harness on, but once they get used to it they will love spending the time with you and getting fresh air. Pigs also love meeting new people and getting attention from other pedestrians (because they always do!). In order to prevent your pig from getting into trouble, it is a good idea to have a pen set up for him in case you have to leave the house. A bored pig can be a destructive pig (just like a dog). If you put your piggy in a nice sized pen (inside or outside) with lots of toys, and access to water and a litter box, you should have no problems! We train our Mini Pigs to potty outside like a puppy and to be litter box trained if inside. You need to ensure that the litter box/pan is easy for them to get into and out of. We suggest using dog litter boxes since they have a low opening in the front. Long, low under-the-bed sweater boxes work nicely if one is cut down for easy entry. Pigs don't like climbing over the edge of a traditional cat litter box. At Three Little Pigs, we use NON-cedar wood chips, or pine litter pellets. You can also use large pine shavings. Some people even prefer to use puppy pads. Litter training seems to come naturally to micro pigs and is extremely easily to train. Most pick it up within a few days. Pigs are inherently clean animals and prefer to use the same spot each day. So its important maintain the same spot in the home as opposed to moving the litter box around, because they will continue to use that spot with or without the litter box. It is important to always use POSITIVE reinforcements when training your Mini Pig. As with training any other animal, being impatient or frustrated will not lead to a good outcome. At Three Little Pigs we generally start the harness training if possible. It is important to start this training at a young age. First get your piggy used to walking around the house with a harness on. Once you feel that your pig is ready for more add the leash and gently and gradually use the lease along with treats if needed to steer and direct your pig. Keep on gradually building your Mini Pig up to new an outdoor surroundings (in a secure area if possible). Soon enough, your Mini pig will be able to walk along the sidewalk with you as a dog would! Rooting is a natural behaviour in pigs. They use their nose to dig up grubs and other “treats” from within the ground. The Mini Pig is no different, so this behaviour should be allowed and facilitated. It is ideal if a Mini Pig has a rooting area both inside and outside your home. A rooting box can be built with wood and a solid bottom approximately two inches high filled with smooth rocks no smaller than a fist. Along with a sprinkle of treats, plastic play balls, newspaper or anything else that would be safe for a piggy to root and play with can be added to their box. Having a secure outside area designated for your Mini Pig to run and root around in is a plus. If you are limited in outside space don’t worry, extra walks and enrichment inside should provide sufficient entertainment for your Mini Pig. If you let your piggy roam freely all over your perfectly manicured lawn- it may not be that way for long! We love have a sand footing in our pig yards- it provides them lots of rooting fun and enrichment ans is never muddy! Mini Pigs are so intelligent they can figure out how to get into just about anything. If there is a cupboard within their reach, they WILL figure out how to get into it and help themselves to whatever they find! It is important to ensure the food pantry and poison closet has child-proof locks on them. When young, they should always be supervised when allowed to roam the home so that you can catch any unwanted behaviours. Pigs are much more intimidated when disciplined than your average dog and are quick to learn. However, in order to prevent your pig from getting into trouble, it is a good idea to have a secured area set up for him in case you have to leave the house. A bored pig can be a destructive pig (just like a dog). If you put your piggy in a nice sized pen (inside or outside) with lots of toys, and access to water and a litter box, you should have no problems! Eventually they will learn, much like a dog (and quicker than most dogs) making it safe that they be given the run of the home. Pigs, like dogs, do like to have a spot they can call their own - it adds to their stability. Some owners start their pigs in a crate or “pack-n-play” (often used for babies). As they get older and are given run of the home, the mesh end of it can be cut and they have their own exit and entrance! Piggies also LOVE warm soft and fuzzy blankets to burrow themselves into. They will frequently drag their blankets around the house with them. Hiding under a blanket is a source of comfort for pigs. Provide numerous blankets if possible: one for inside, one for the car, one for outside housing. Some pigs however, may prefer to snuggle up to other pets that you have. But best of all, if you are okay with it, there is no place that they would rather be than right in your bed with you under the blankets. There is SO much to learn about training, enrichment and entertainment of a mini pet pig. If you wish to learn a bit more please follow the link below!